Governments and central banks have tackled the financial crisis of 2008 with fireworks of liquidity. This way, they have laid the foundation for the next crisis. Among central bankers, the new credo says that all crises are liquidity crises. Consequently, more money must be created to fight the contraction. Yet what if too much liquidity was the origin of the crisis in the first place? Then we are climbing the steps of a stairway and the higher we get the deeper we fall. If the past financial crises were not liquidity crises, but capital crises, the world economy must face solvency problems. Then, liquidity injections would no longer work as expected. Creating money by buying debt from the private sector has turned the central banks into “bad banks” where the credit junk accumulates. As the counter piece, commercial banks have accumulated new cash reserves in record volume. The financial crisis was identified as a liquidity crisis and has consequently led to flooding of the global financial system with money. One of the insights of Austrian economics says that if capital crises are mistakenly diagnosed as liquidity crises and their monetary alimony continues, the mismanagement deepens, and the capital structure of the economy becomes more distorted. The longer this process lasts, the more painful will be the adjustment processes required after the turning point. Central bankers and fiscal policymakers are trapped in the perverse logic of interventionism that says that if the cure does not work with the present doses, it must be increased. Over the past decade, low interest rates in the United States, Japan, and Euro Area have promoted the emergence of zombie companies, and have helped, particularly in the United States, to register very low unemployment rates. Yet what if interest rates will continue to rise? Then it will be revealed that many of the current jobs cannot be maintained because they are linked to failed capital investments. What will happen when the next crisis shows up as a capital crisis in its late stages? This would prove that the crises over the past decades were all capital crises.. Only so long as the capital crisis was still in its early stages, more liquidity served as a temporary remedy. By doing that, however, the world economy has moved closer to the cliff. The next time the music may stop. The expansion of global liquidity goes hand in hand with more debt. Over the past 15 years, global debt rose by $150 trillion to $247 trillion in the first quarter of 2018. The path to a financial crisis leads over a pile of debt. In the public sector, it is excessive government spending and incoherent economic policies that lead to undue debt accumulation. In the private sector, it is the easy access to loans in combination with the need to make ends meet that pushes consumers into debt. Companies amass debt because the low-interest rates make even mediocre projects lucrative. In any of the cases, the debt process is unsustainable. Most economic actors know it but pile up debt anyway because the temptation of the extremely low interest rates is simply too great to resist. 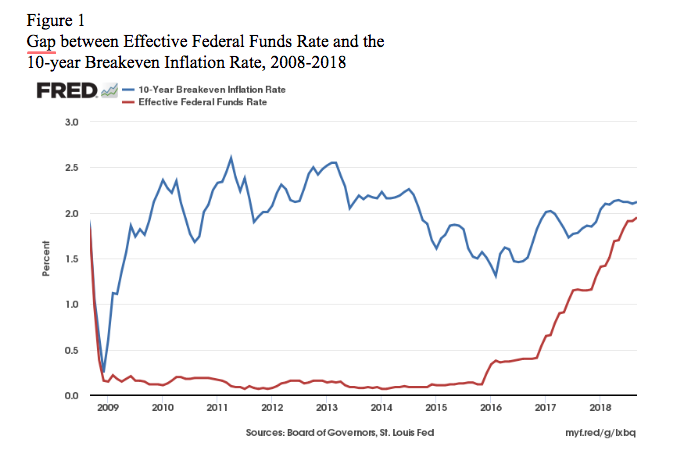 The graph (Figure 1) compares the effective federal funds rate to the 10-year break ven inflation rate. This comparison depicts the gap between expected yearly inflation over ten years (upper blue line) and the lending rate of the central bank (lower red line). The gap was around two percentage points from 2010 to 2015 after which the hiatus began to close because of the policy of the American central bank to increase the federal funds rate in December 2015. Despite a series of further rate hikes, there is still a gap in place in October 2018, in part because inflationary expectations have risen. The attractiveness of the low-interest rates has not only enticed domestic borrowers — government, business, and consumers — but also foreign borrowers, particularly governments and companies in emerging economies. Emerging markets foreign currency debt rose from $4.5 trillion in 2008 to $8.3 trillion at the end of 2017. Many countries are already in a precarious situation, most prominently Turkey. It takes two to tango and where there is a borrower, a lender must also be. In spite of better knowledge, international investors lend often freely because they expect a rescue package from the national governments and the international organizations if something should go wrong. Governments and central banks in creditor countries play their part in providing the safety net, triggering moral hazard. In addition to the lenders and borrowers, a debt festival also needs a band that plays the music, i.e. delivers the liquidity. This factor usually gets too little attention. The responsible institutions shun a reform of the international monetary system. They act like the indolent farmer whose barn has a big hole in the roof, but he will not repair it because when there is sunshine he does not need to and when it is raining he cannot. Since the end of the gold standard, the international monetary system has no anchor and is undergoing massive waves of expansion and contraction. During the phases of the flood of liquidity, profound global imbalances occur. Extreme current account deficits in some countries imply large surpluses in others. The longer these imbalances last, the harder they are to correct. When the correction takes place, the adjustment is abrupt and hard. Global debt, fueled by the monetary excesses of the central banks, has heightened the fragility of the system. The number of financial market operators is on the rise for which the equity is too low to compensate for unexpected losses in the value of their assets. Too many institutions still bank on a bailout. They operate on the basis that when troubles should come, their cry for the state would be heard. As usual, the heads of the corporations will argue that if the government did not help, the whole financial system would collapse. This was the game that was played during the 2008 financial crisis. As a result, the intervening governments and central banks have accumulated immense debts and are themselves in a state of fragility. With the next financial crisis, the question arises who will rescue the rescue team? If, as is usual today, the managers of the international banks and funds, as well as the heads of the rating agencies, the World Bank, and the International Monetary Fund, focus on growth rates, investment rates, and price levels to diagnose the health of an economy, they will again be subjected to grave misjudgments. These analyses are incomplete to grasp the dynamics of the business cycle because they leave out the role of capital. Without much thought, central bankers and fiscal policymakers define financial crises as a liquidity crisis. Consequently, they try to remedy a crisis with more money and credit. The global financial system climbs up the ladder as one crisis sets the conditions for the next. The game can go on only as long as the last step is not yet taken. The state and the central bank as unlimited lenders of last resort are then called to the scene as the ambulance. The state is welcomed as a savior even though it was the state authorities that laid the foundations for the emergence of the crisis through their expansive monetary policy. One of the great tragedies of our time is that economic crises are misinterpreted as “capitalist crises” and that the “free market” is named as the cause, if, firstly, today, all money is state money and, secondly, the financial markets are among the most highly regulated economic sectors. 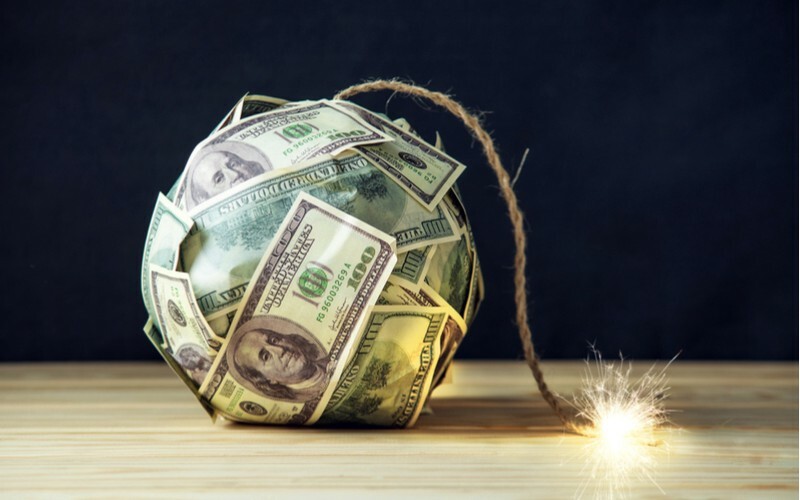 In fact, the only way out of the destructive cycle of boom and bust is when the state withdraws both from investment direction and from the establishment of money as a legal tender. Send me an e-mail. See my Amazon author page. Originally published at www.aier.org on October 15, 2018.